Organized at Indianapolis, Ind., and mustered in December 13, 1861. Left State for Louisville, Ky., January 24, 1862. Attached to Artillery, 4th Division, Army of the Ohio, to March, 1862. Artillery, 6th Division, Army of the Ohio, to September, 1862. 15th Brigade, 6th Division, 2nd Corps, Army of the Ohio, to November, 1862. 1st Brigade, 1st Division, Left Wing 14th Army Corps, Army of the Cumberland, to January, 1863. Artillery, 1st Division, 21st Army Corps, Army of the Cumberland, to October, 1863. 2nd Division', Artillery Reserve, Dept. of the Cumberland, to November, 1863. Garrison Artillery, Chattanooga, Tenn., to January, 1865. SERVICE.--Movement to Nashville, Tenn., February 10-25, 1862. Occupation of Nashville February 25 to March 17. March to Savannah, Tenn., March 17-April 6. Battle of Shiloh, Tenn., April 7 (Reserve). Advance on and siege of Corinth, Miss., April 29-May 30. Pursuit to Booneville May 31-June 12. Buell's Campaign in Northern Alabama and Middle Tennessee June to August. Action at Little Pond, near McMinnville, August 30. March to Louisville, Ky., in pursuit of Bragg August 30-September 26. Pursuit of Bragg to Loudon, Ky., October 1-22. Battle of Perryville, Ky., October 8 (Reserve). Nelson's Cross Roads October 18. March to Nashville, Tenn., October 22-November 7, and duty there until December 26. Murfreesboro Pike November 9. Advance on Murfreesboro December 26-30. Lavergne December 26-27. Battle of Stone's River December 30-31, 1862. and January 1-3, 1863. Duty at Murfreesboro until June. Middle Tennessee (or Tullahoma) Campaign June 23-July 7. Occupation of Middle Tennessee until August 16. 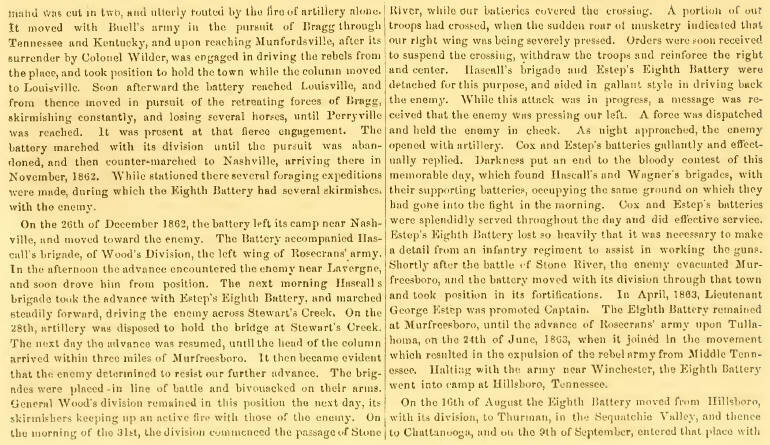 Passage of the Cumberland Mountains and Tennessee River and Chickamauga, (Ga.) Campaign August 16-September 22. Lee and Gordon's Mills September 11-13 and September 17-18. Battle of Chickamauga September 19-20. Siege of Chattanooga, Tenn., September 24-November 23. Chattanooga-Ringgold Campaign November 23-27. Duty at Chattanooga until March, 1865. (A detachment at Resaca, Ga., until November, 1864, participating in the repulse of Hood's attack on Resaca October 12. Rejoined Battery at Chattanooga November, 1864.) Non-Veterans mustered out January 25, 1865. Veterans and Recruits consolidated with 7th Indiana Battery March 13, 1865.